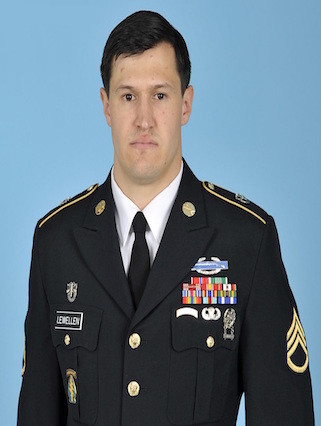 SFC Matthew C. Lewellen was born on January 15, 1989 in Kirksville, Missouri, and raised by his parents Charles and Cynthia Lewellen. He enlisted in the U.S. Army on February 10, and attended Basic Training and the Basic Airborne Course at Fort Benning, Georgia, followed by the Special Forces Qualification Course at Ft. Bragg, North Carolina. After graduating as a Special Forces Engineer Sergeant, he was assigned to 5th Special Forces Group (Airborne), Fort Campbell, Kentucky, where he served with both the 3rd and 4th Battalions. SFC Lewellen deployed three times, supporting Operation ENDURING FREEDOM and other contingency operations. SFC Lewellen’s military education included the Special Forces Qualification Course; Survival, Evasion, Resistance, and Escape Course; the Special Forces Sniper Course; Advanced Leader Course; Basic Leader Course; and the Basic Airborne Course. SFC Lewellen’s awards and decorations included the Bronze Star Medal, the Army Commendation Medal, Army Good Conduct Medal (2nd Award), ), the NATO Service Medal; the National Defense Service Medal, the Afghanistan Campaign Medal with Campaign Star, the Global War on Terrorism Expeditionary Medal, the Global War on Terrorism Service Medal, the Non-Commissioned Officer Professional Development Ribbon (Numeral 2), the Army Service Ribbon, the Overseas Service Ribbon, the Special Forces Tab, the Combat Infantryman Badge, and the Parachutist Badge. SFC Lewellen was posthumously awarded the Purple Heart and the Bronze Star Medal (1 Oak Leaf Cluster). SFC Lewellen is survived by his mother, Cynthia M. Lewellen and his father, Charles D. Lewellen Jr of Kirksville, Missouri.